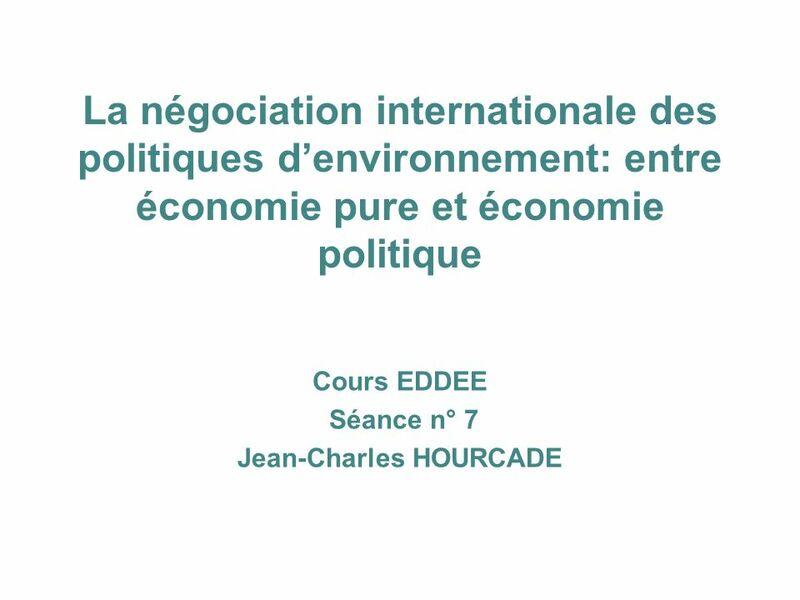 La négociation internationale des politiques denvironnement: entre économie pure et économie politique Cours EDDEE Séance n° 7 Jean-Charles HOURCADE. 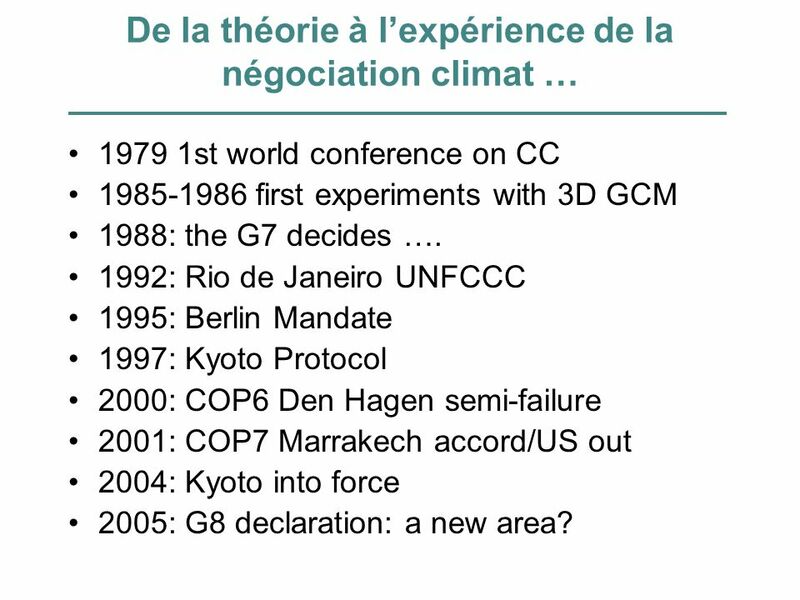 5 De la théorie à lexpérience de la négociation climat … 1979 1st world conference on CC 1985-1986 first experiments with 3D GCM 1988: the G7 decides …. 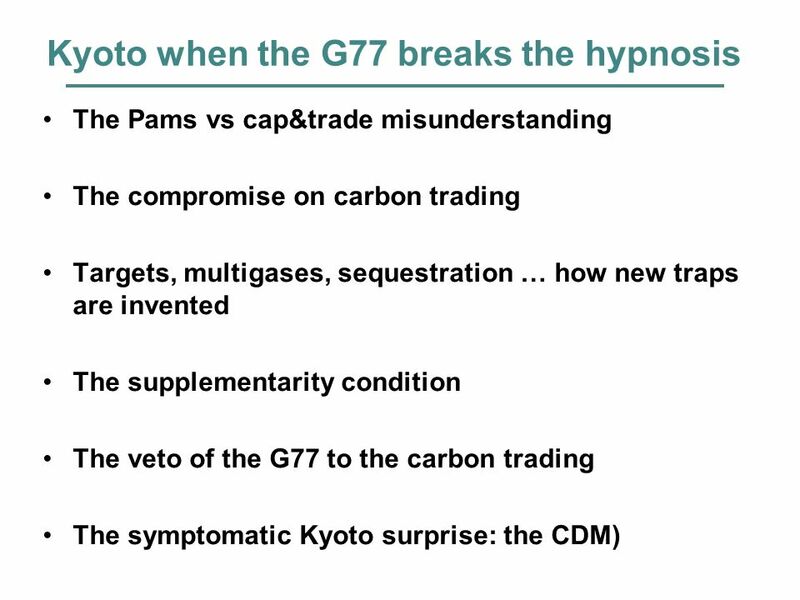 1992: Rio de Janeiro UNFCCC 1995: Berlin Mandate 1997: Kyoto Protocol 2000: COP6 Den Hagen semi-failure 2001: COP7 Marrakech accord/US out 2004: Kyoto into force 2005: G8 declaration: a new area? 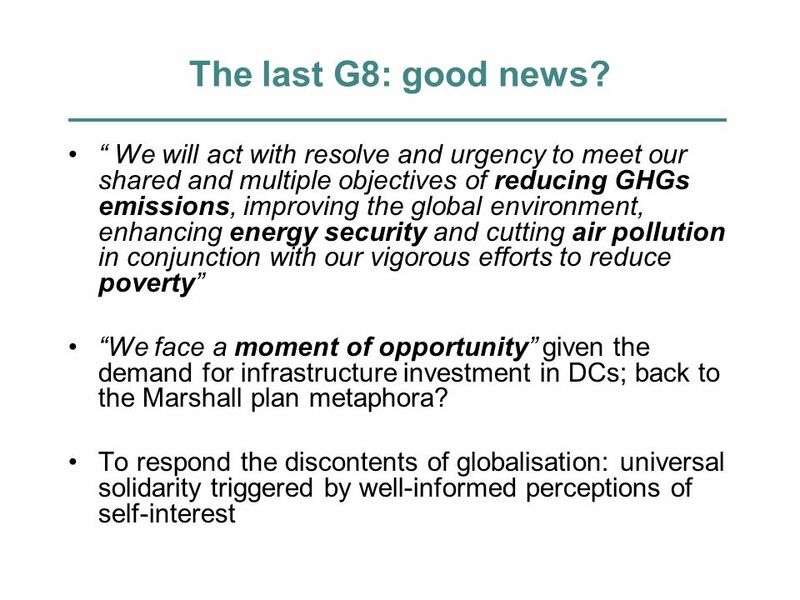 6 In illo tempore… Whats bitten Bush(sr) and Thatcher at the 1988 G7? 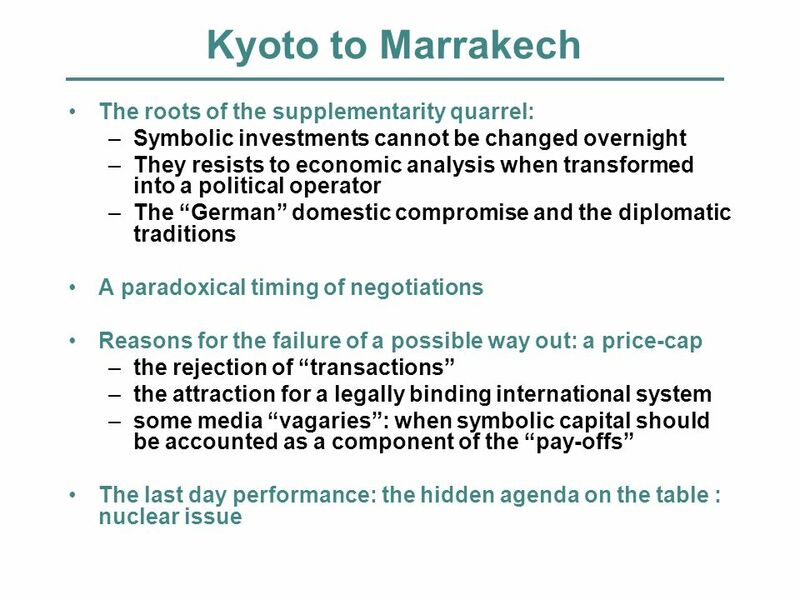 - Back to Independence 1980 (Nixon) - In a context of unstable Middle-East, P erestroïka and Emerging China and India …. 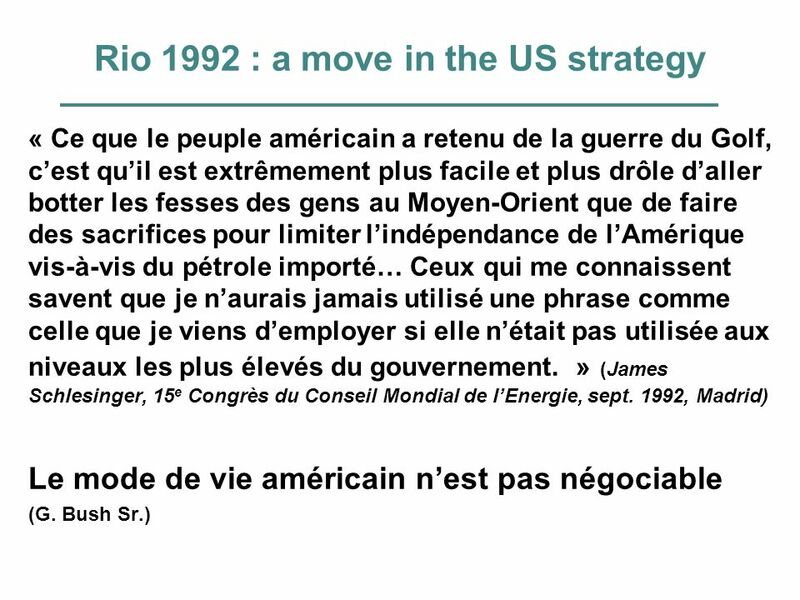 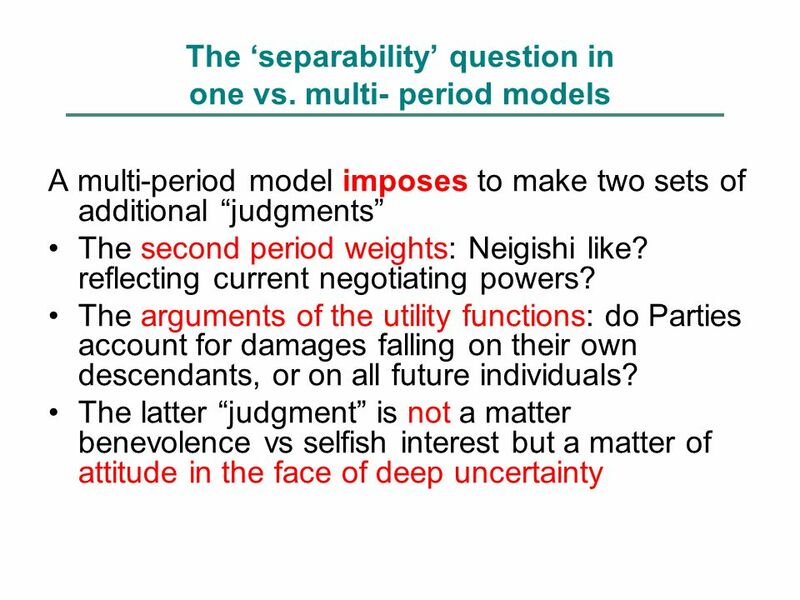 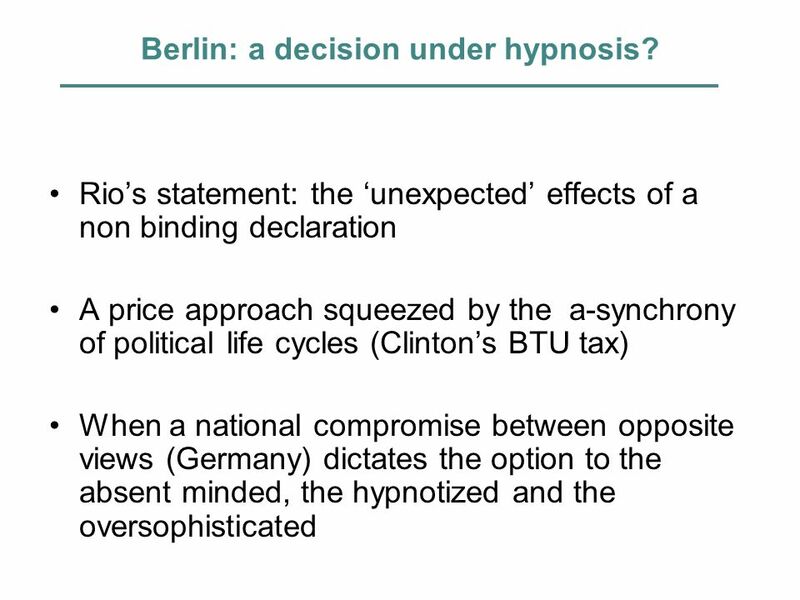 - A question of Energy Security (Schlessinger WEC 1989) Why the EU promptly picked the window of opportunity? 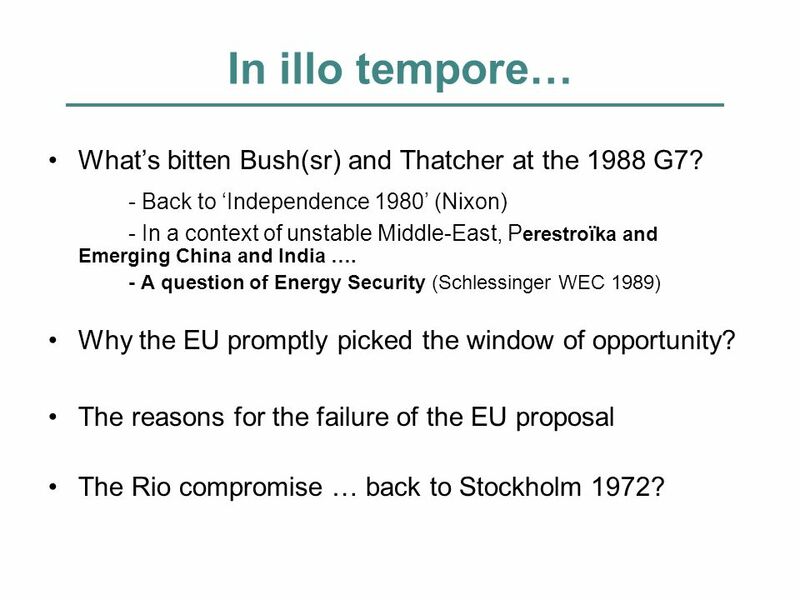 The reasons for the failure of the EU proposal The Rio compromise … back to Stockholm 1972? 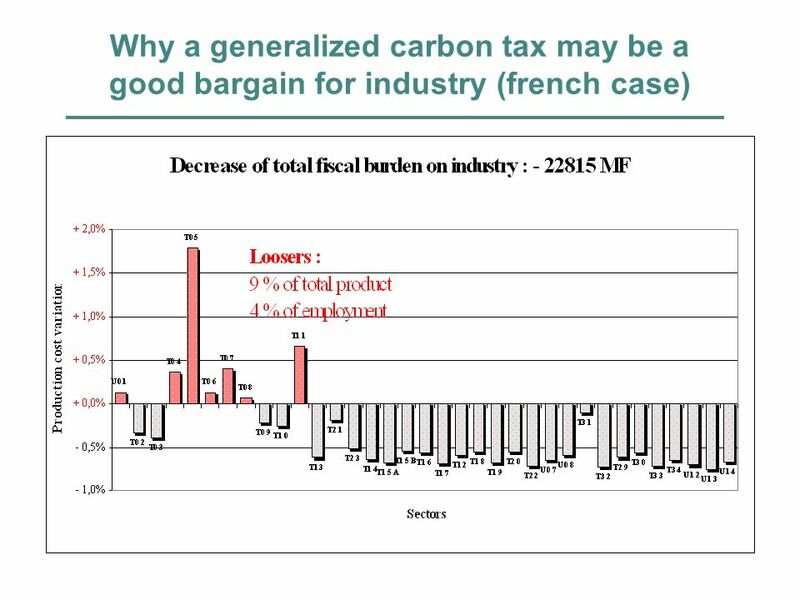 9 Why the EU carbon energy tax failed? 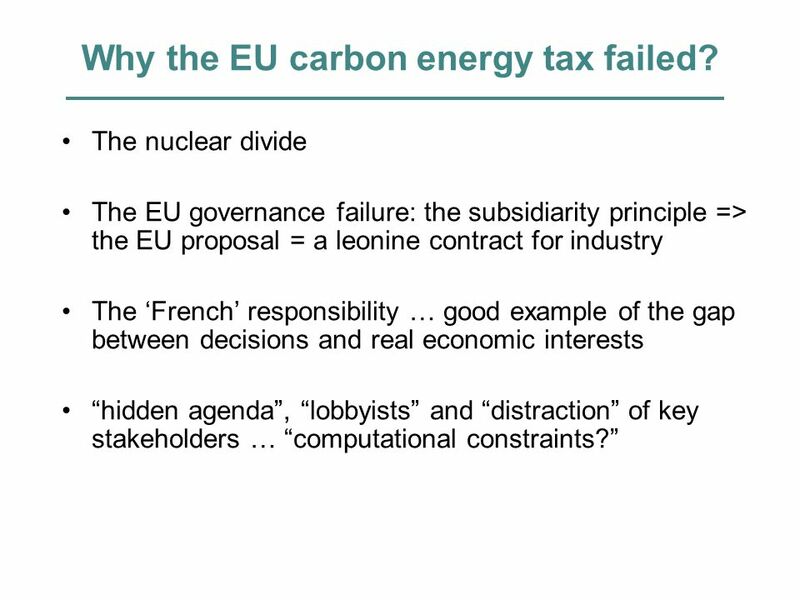 The nuclear divide The EU governance failure: the subsidiarity principle => the EU proposal = a leonine contract for industry The French responsibility … good example of the gap between decisions and real economic interests hidden agenda, lobbyists and distraction of key stakeholders … computational constraints? 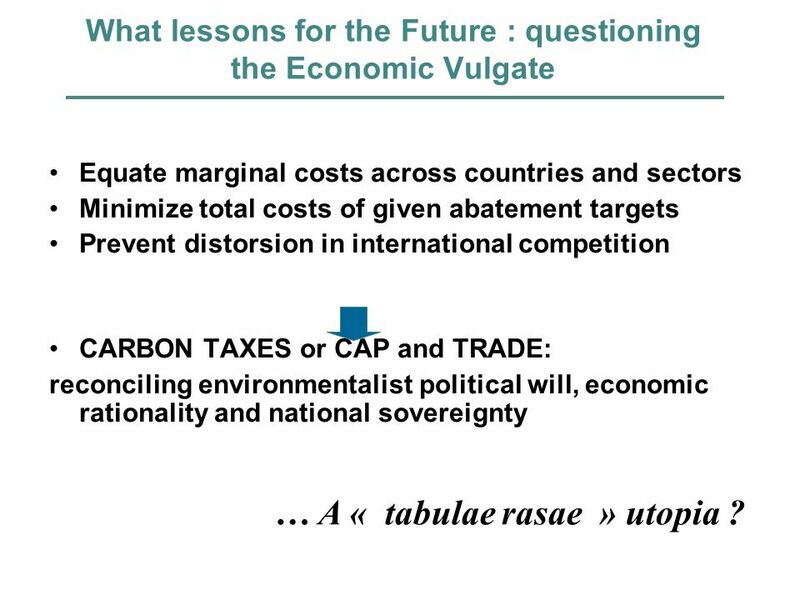 21 What lessons for the Future : questioning the Economic Vulgate Equate marginal costs across countries and sectors Minimize total costs of given abatement targets Prevent distorsion in international competition CARBON TAXES or CAP and TRADE: reconciling environmentalist political will, economic rationality and national sovereignty … A « tabulae rasae » utopia ? 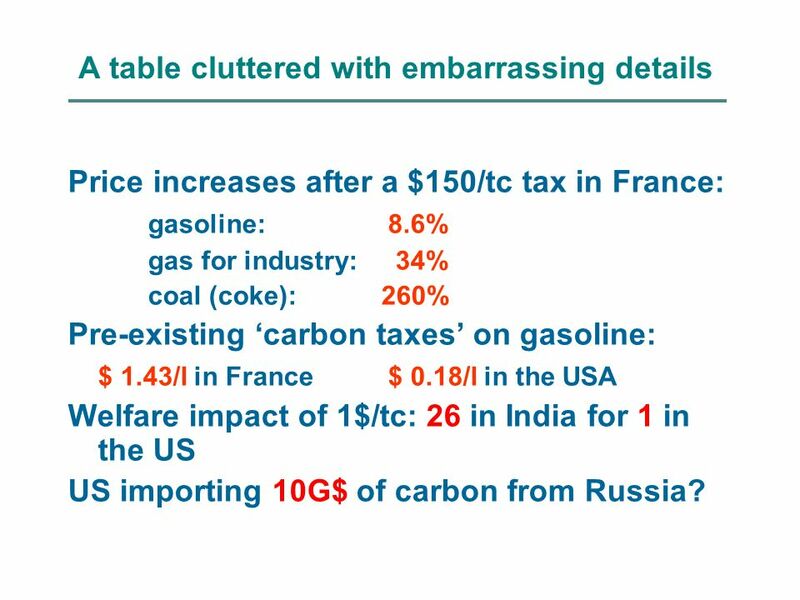 22 A table cluttered with embarrassing details Price increases after a $150/tc tax in France: gasoline: 8.6% gas for industry: 34% coal (coke): 260% Pre-existing carbon taxes on gasoline: $ 1.43/l in France $ 0.18/l in the USA Welfare impact of 1$/tc: 26 in India for 1 in the US US importing 10G$ of carbon from Russia? 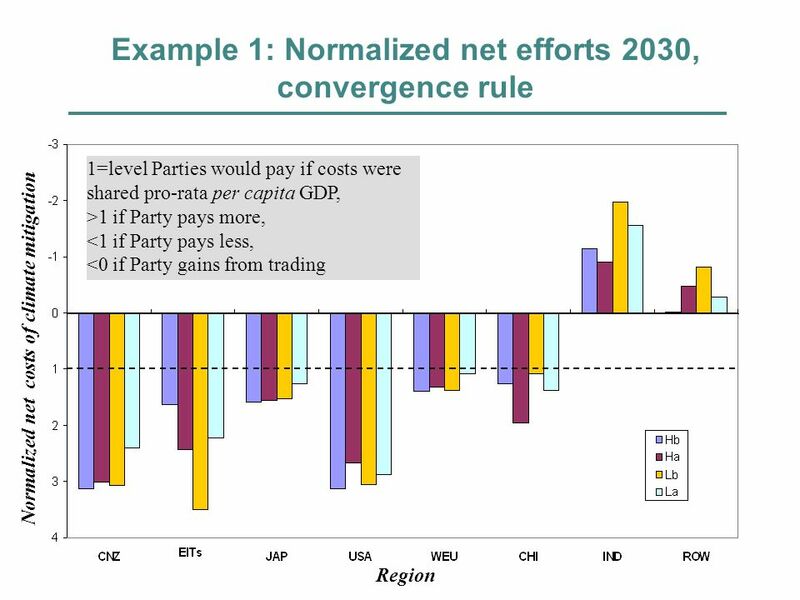 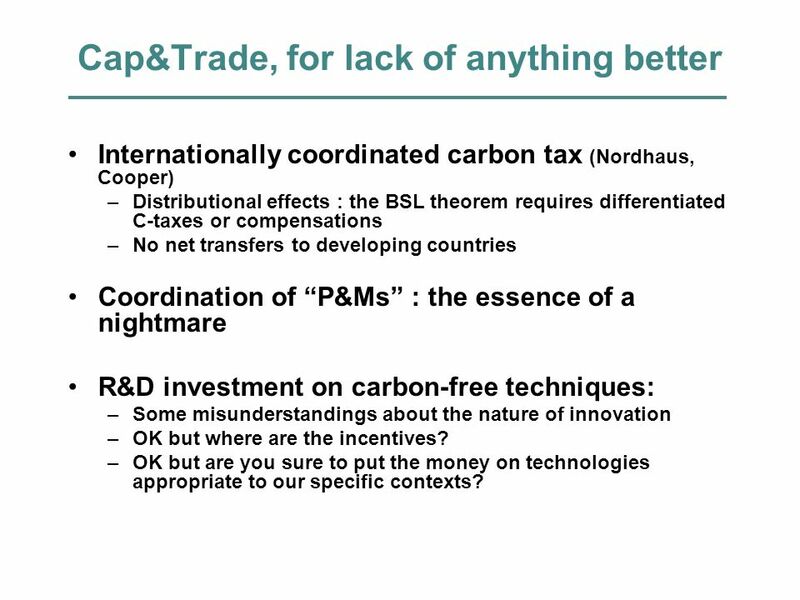 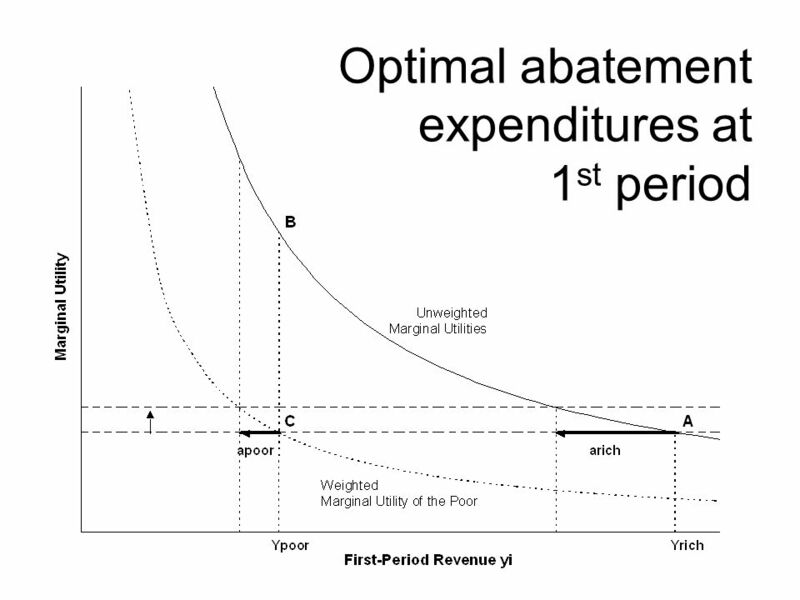 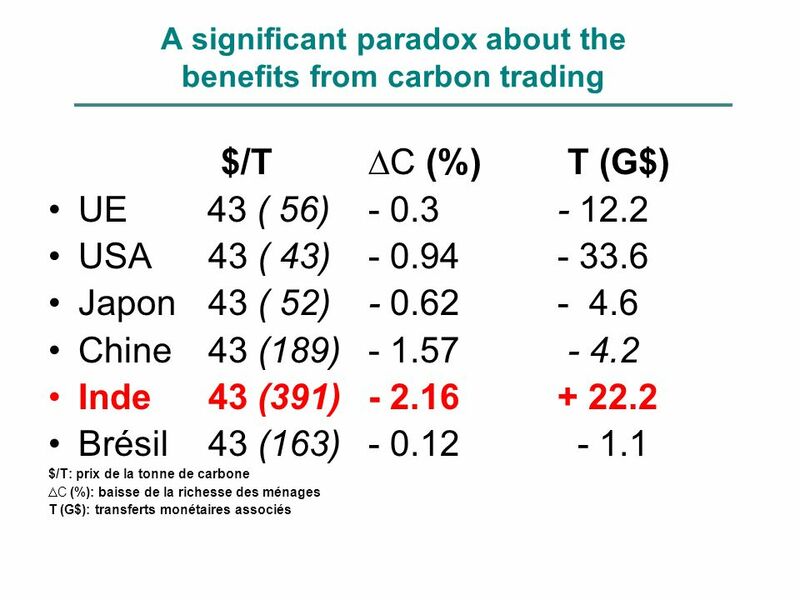 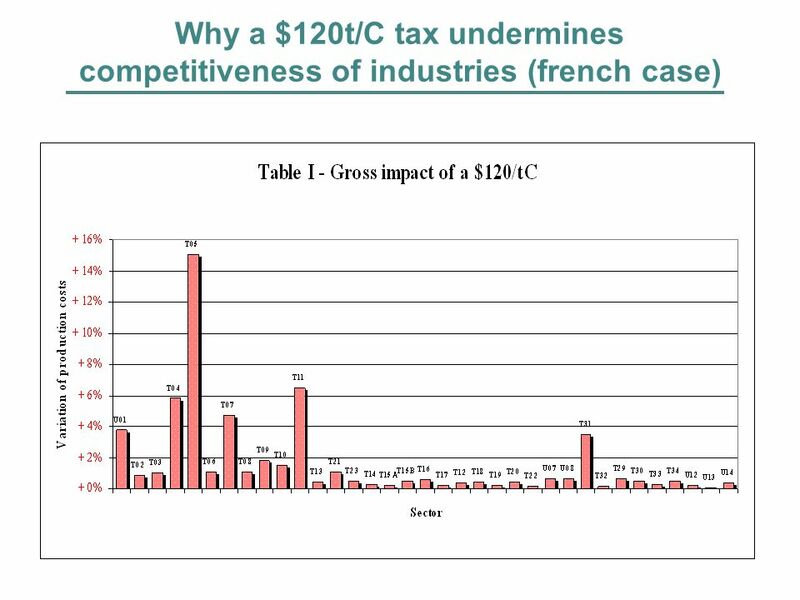 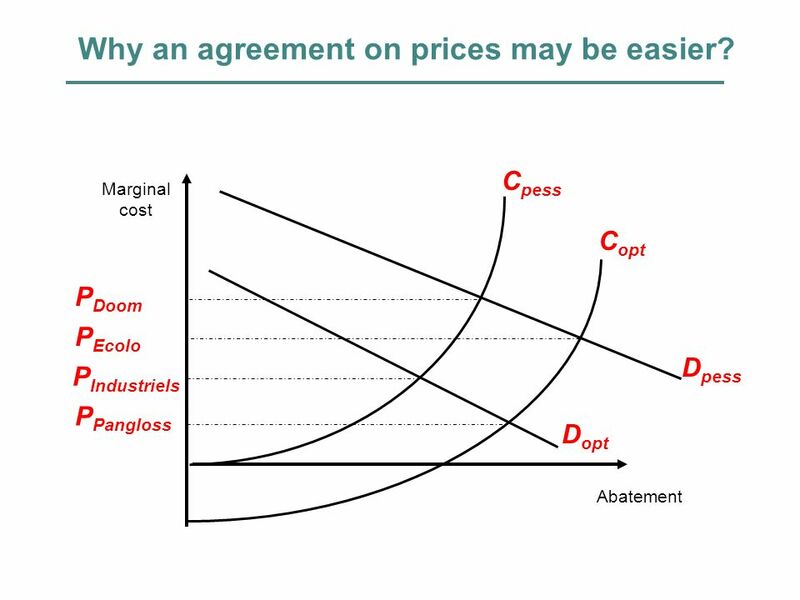 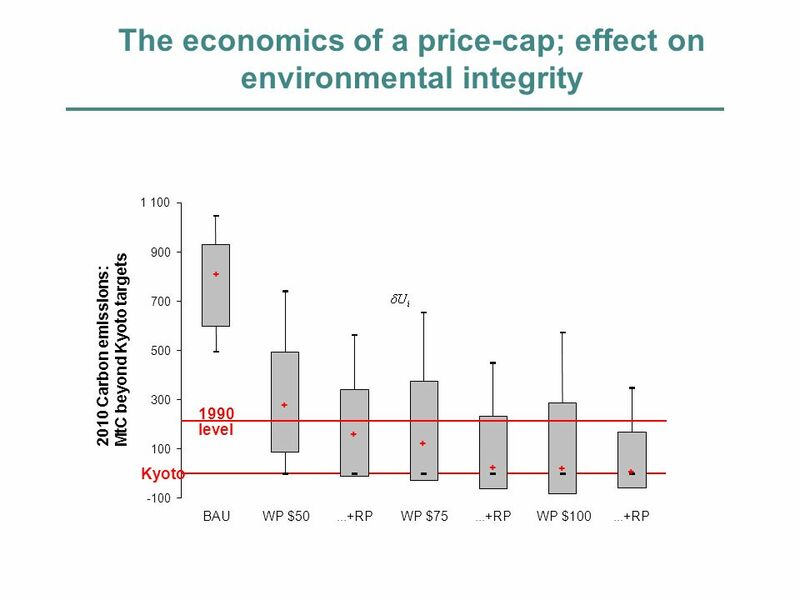 25 Cap&Trade, for lack of anything better Internationally coordinated carbon tax (Nordhaus, Cooper) –Distributional effects : the BSL theorem requires differentiated C-taxes or compensations –No net transfers to developing countries Coordination of P&Ms : the essence of a nightmare R&D investment on carbon-free techniques: –Some misunderstandings about the nature of innovation –OK but where are the incentives? 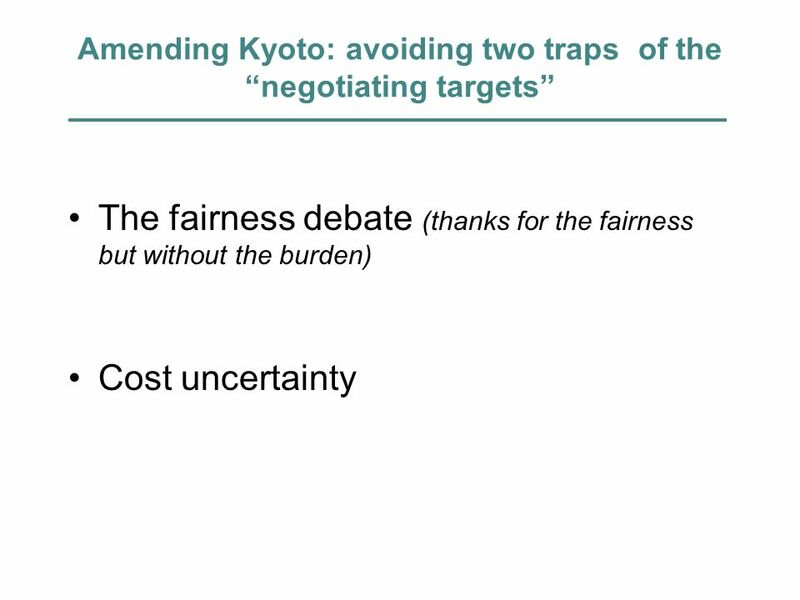 –OK but are you sure to put the money on technologies appropriate to our specific contexts? 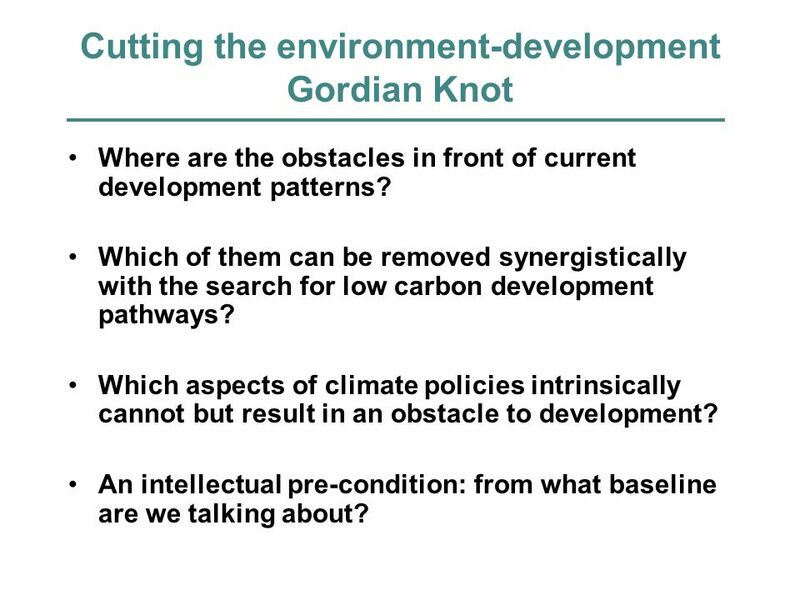 28 Cutting the environment-development Gordian Knot Where are the obstacles in front of current development patterns? 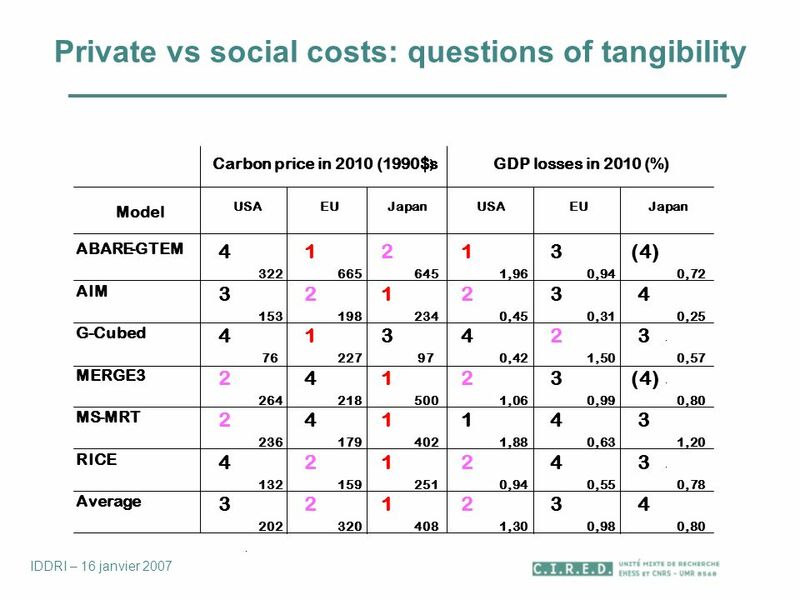 Which of them can be removed synergistically with the search for low carbon development pathways? 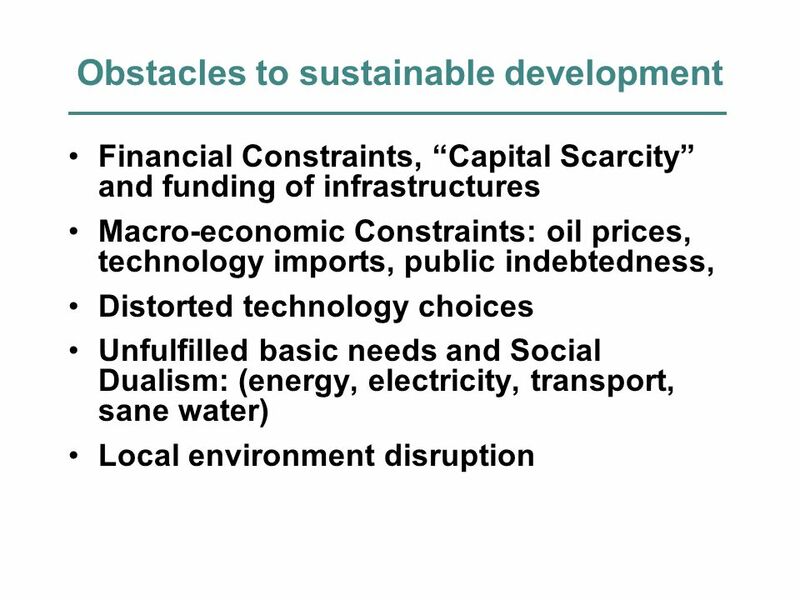 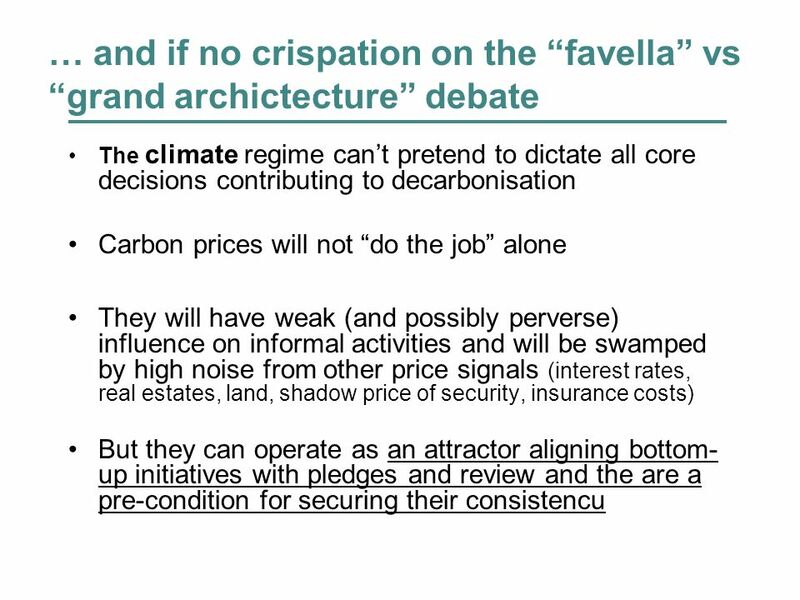 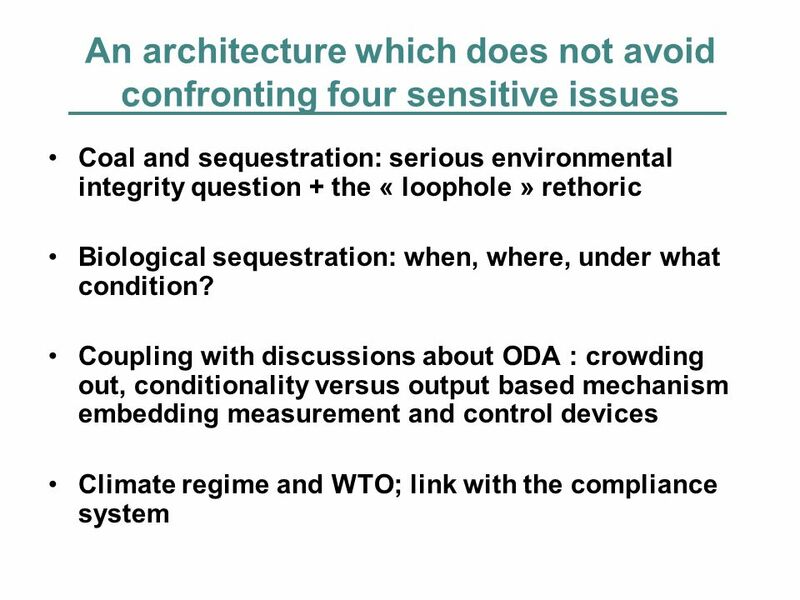 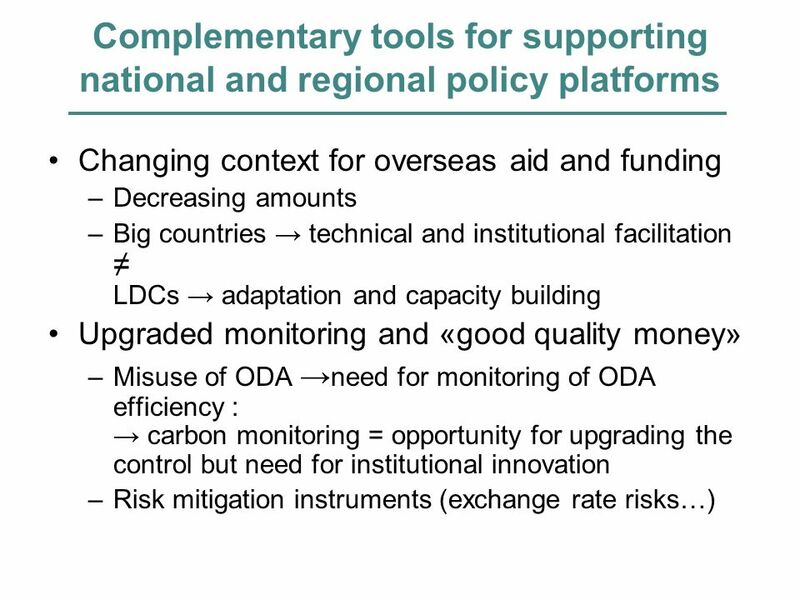 Which aspects of climate policies intrinsically cannot but result in an obstacle to development? 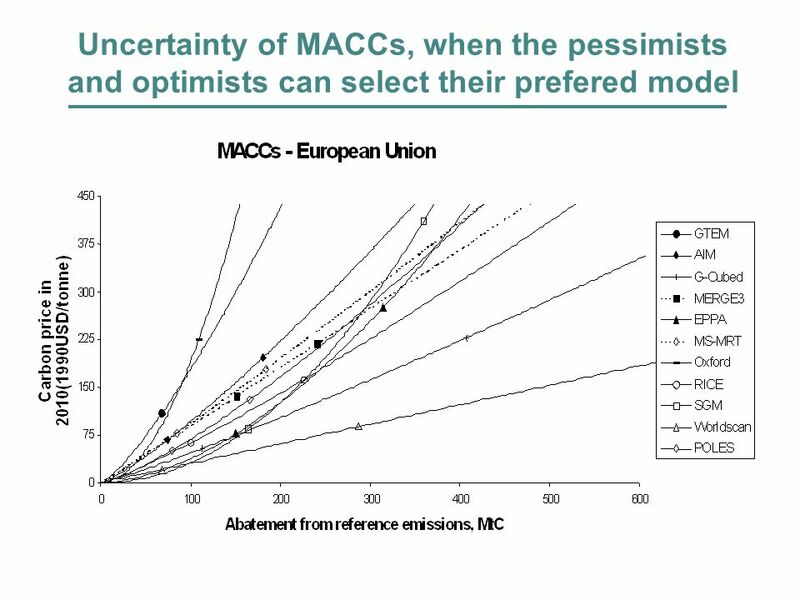 An intellectual pre-condition: from what baseline are we talking about? 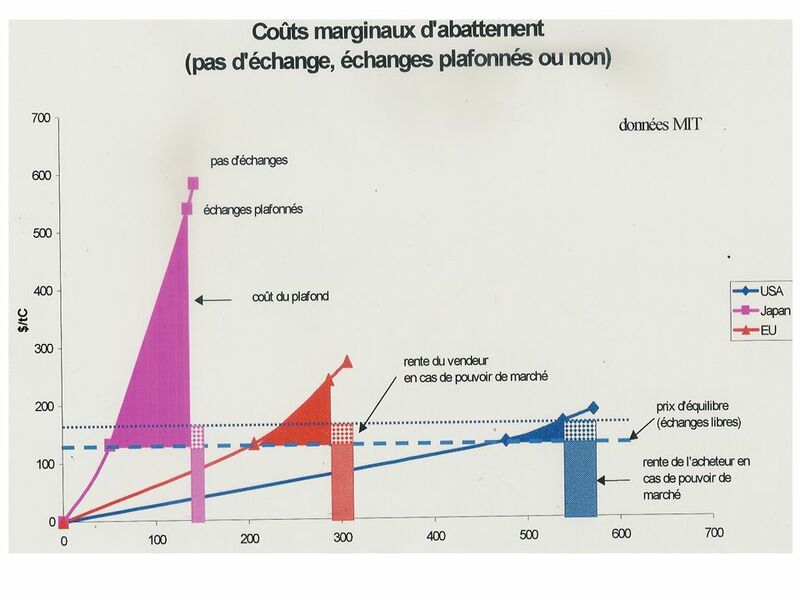 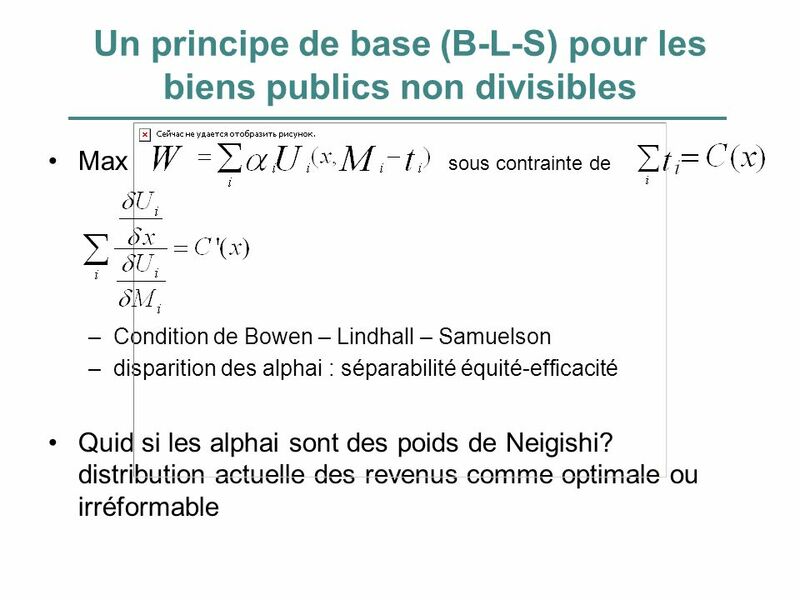 Download ppt "La négociation internationale des politiques denvironnement: entre économie pure et économie politique Cours EDDEE Séance n° 7 Jean-Charles HOURCADE." 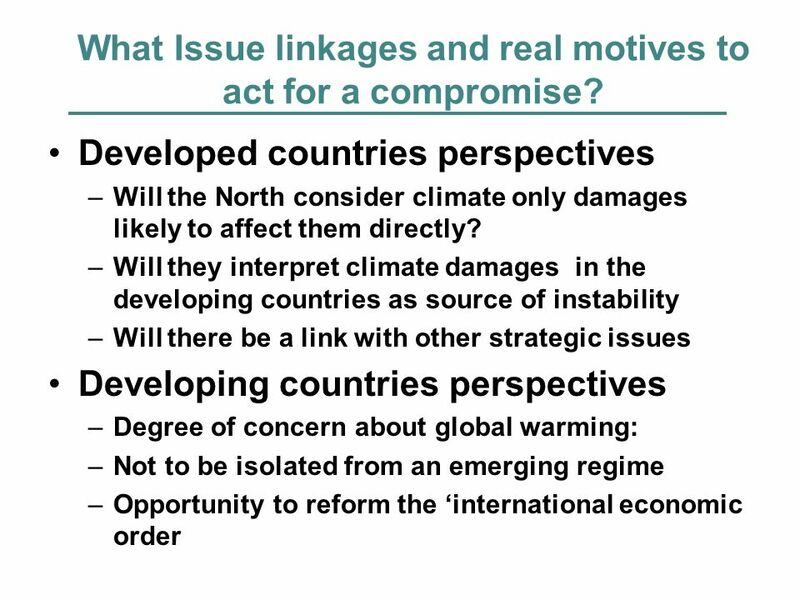 International Climate Change Partnership Maintaining the Flexibility of the Flexible Mechanisms Fred Sciance General Motors on behalf of The International. 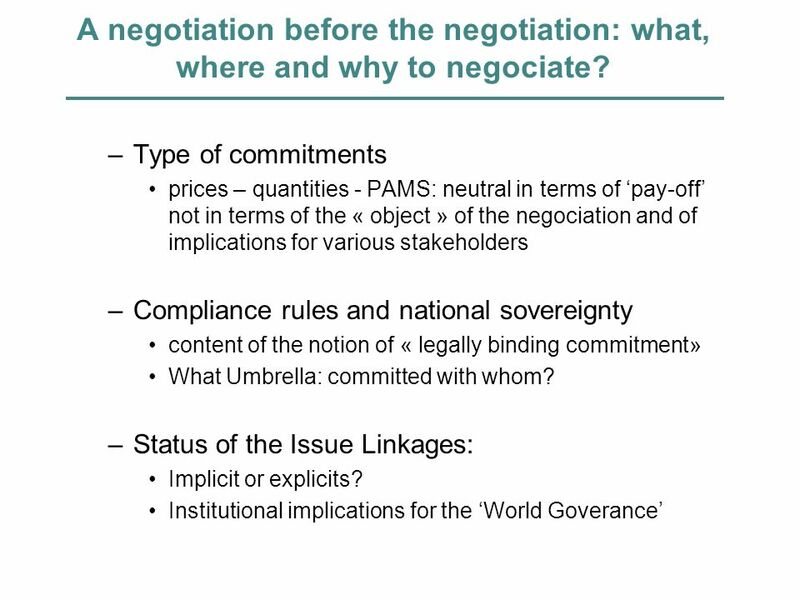 Framework Convention on Climate Change n Basis for all negotiations since 1992 n Ratified by 186 Countries n Ratified by United States n Commits all Parties. 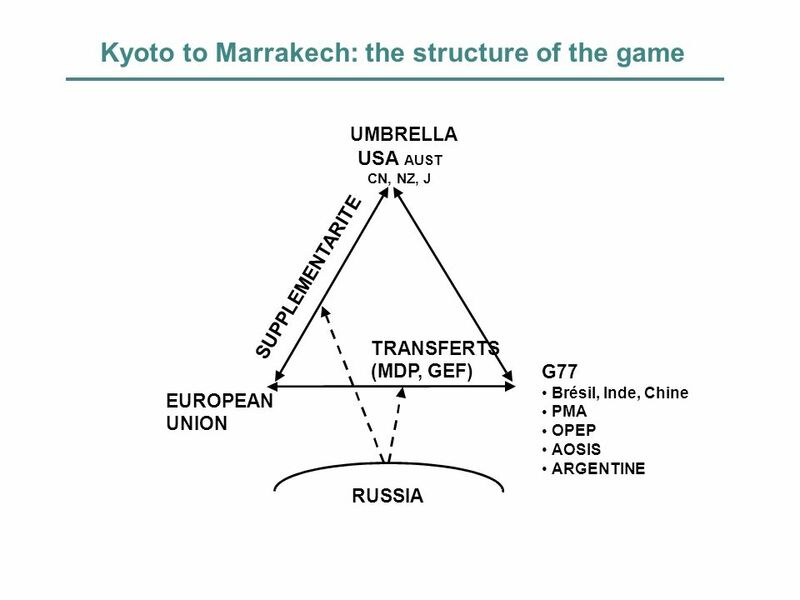 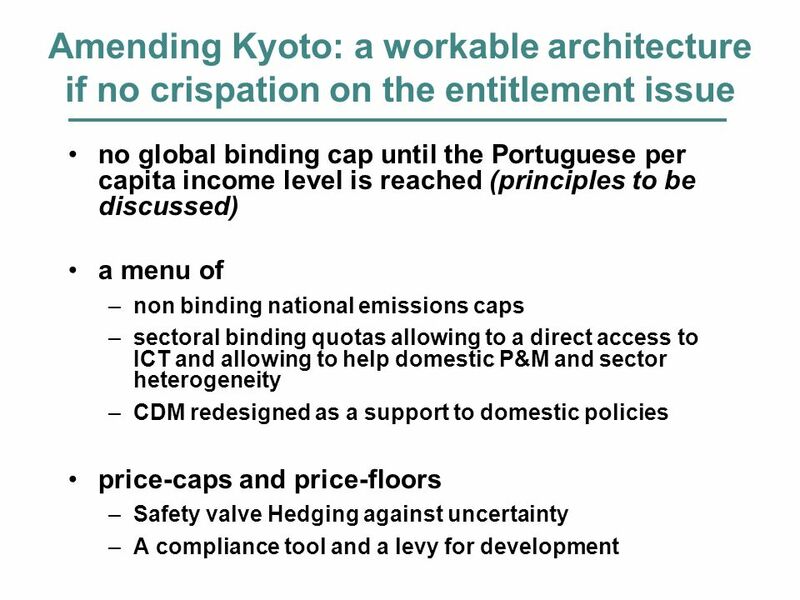 Beyond the Kyoto Firewall The Durban Platform, the Russian Proposal and Differentiation of Country Groups Anna Korppoo Moscow, 26 January 2012. 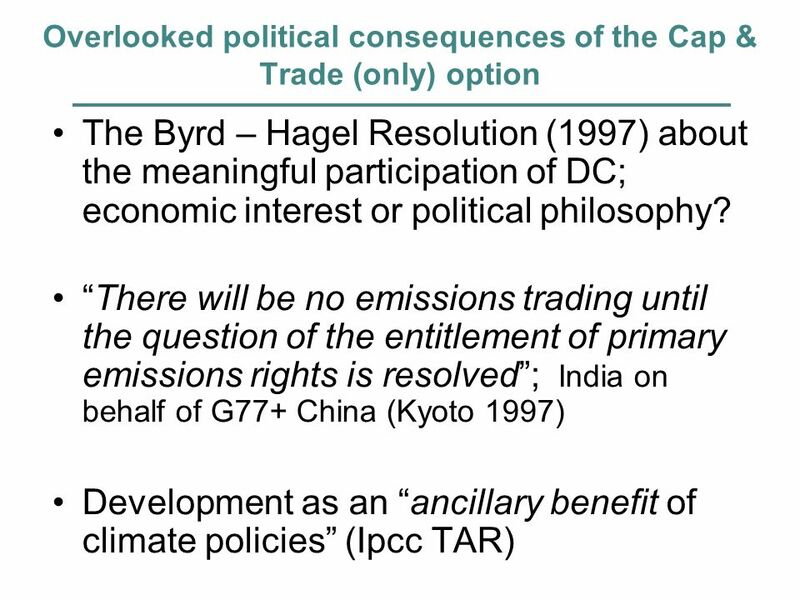 Negotiating climate change - Issues and options - Christine Zumkeller Bonn – Cambridge, February 2008.